Nystan is an effective antifungal treatment for oral thrush. After answering a few quick questions about your general health and condition, our doctor will evaluate the suitability of Nystan and write a prescription if appropriate. Our UK pharmacy will dispense the treatment and, so long as your order is approved before 3pm, the pharmacy will send out your treatment the same day. How do I take Nystan oral suspension? Nystan oral suspension is an antifungal medicine which is used to treat oral thrush. It directly kills the fungus, ridding the infection and clearing the symptoms quickly. Oral thrush is a condition which is caused by an exponential growth of a natural fungus known as Candida. Who is more at risk of developing thrush? Your doctor or dentist can diagnose oral thrush based on the clinical image. In some cases, a sample of the spores may be taken and examined under a microscope. Your doctor may recommend a blood test to determine if there may be an underlying medical condition which may put you at a higher risk of developing oral thrush. Following our quick and simple medical questionnaire, our doctors can issue a prescription for Nystan which our UK registered pharmacy can fulfil. Nystan oral suspension contains an antifungal called nystatin. It works by weakening the cell walls of the fungus, allowing the contents of the cell to spill out, thus killing the cell and clearing the infection. Nystan oral suspension should be taken exactly as instructed by your doctor or pharmacist. The recommended dose for adults is 1ml of suspension dropped into the mouth four times a day. Take Nystan after each meal and before you go to bed. Clean your teeth or dentures. Your mouth should be clean before using the medicine. Using the provided measuring pipette, measure 1ml of the solution by squeezing the bulb at the top. Squirt the medicine into your mouth and swill it around your mouth for approximately 3 minutes. Swallow the medicine. Do not spit the medicine out. If you have dentures, remove them before swishing the suspension around your mouth. Wait 20 minutes after using Nystan before eating or drinking anything. How long should I take Nystan for? The doctor will prescribe the recommended dose, depending on the severity of your condition and your tolerance towards the medicine. A typical course of Nystan lasts for approximately two weeks. Continue to use Nystan oral suspension for 2 days after your symptoms have subsided. All medicines carry the risk of causing side effects, though not everybody gets them. Understanding the risks associated with your medicine and being vigilant of any changes throughout your course of treatment is vital to your care. If you experience any side effects to this medicine, whether they are listed above or in the patient information leaflet supplied with your medication, report them to your doctor or ask a pharmacist for help. You can find your nearest pharmacy here. Alternatively, you can dial 111 for help from medical professionals. If you experience the signs and symptoms of an allergic reaction, or develop irritation or sensitisation to the medicine, stop taking Nystan and consult your doctor as soon as possible. How will I know if Nystan is suitable for me? 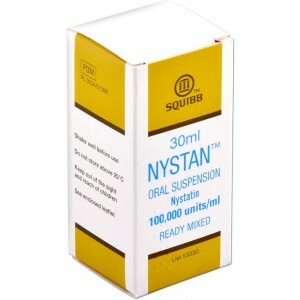 Using Nystan oral suspension for oral thrush should not affect your ability to drive or operate machinery. What should I do if I take more Nystan than I should? Using more of the medicine is unlikely to harm you because very little of the medicine is absorbed by your body. However, using more Nystan can increase your risk of experiencing side effects such as nausea and stomach ache. If you are at all concerned about using more of the suspension than intended, do not hesitate to contact your doctor or a pharmacist. What should I do if I forget to take Nystan oral suspension when I should? If you forget to take Nystan oral suspension when you should, take it as soon as you remember and continue to use your medicine as you normally would. Do not use more of the medicine to make up for the forgotten dose as this can increase your risk of experiencing side effects. What does Nystan taste like? Nystan contains a flavouring which some people describe as cherry and mint with a bitter after-taste. The medicine also contains sucrose for sweetening. If you are allergic to some sugars, speak to your doctor before using Nystan. What should I do if I accidentally spit out Nystan oral suspension? Spitting out Nystan oral suspension should not have impact the effectiveness of the medicine. As long as you swish the medicine around your mouth for a period, the mechanism of the medicine will behave the same as if you swallowed it. Do not double dose if you accidentally spit the medicine out. Can I drink alcohol while using Nystan oral suspension? Alcohol should be avoided while taking Nystan oral suspension and for at least one day after taking your final dose. How to take Nystan Oral Suspension? Description: Nystan is an antifungal medicine which is intended for people with oral thrush. When Pregnant: Inform our prescriber if you are pregnant or planning on becoming pregnant.